That's the common reaction when folks first hear about Mark Wetzel, widely known throughout baseball circles as "The Blind Guy." But Mark has demonstrated a tremendous talent for turning skeptics into believers during his career as a personal instructor for hitters from pre-teens to pros. From his hitting facility in the rolling Ponca Hills on the northern outskirts of Omaha, Nebraska, Mark conducts lessons and consults with hitters who are serious about improving their performance at the plate. Working with a well-trained and experienced crew of assistants, Mark has helped many an aspiring hitter realize his or her dream of achieving success and moving on to the next level. So what's his secret? 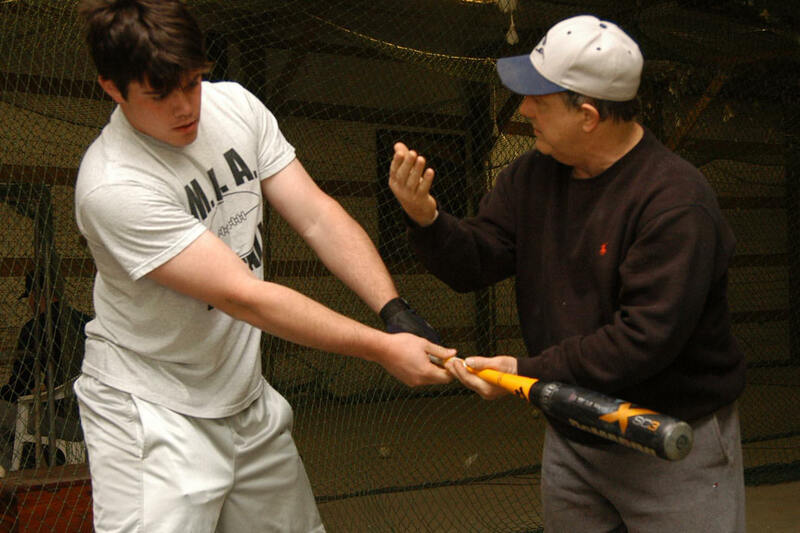 How can a blind guy teach someone to hit a pitched baseball, arguably one of the toughest challenges in all of sports? Mark Wetzel is shown here in an instructional session with two-time First Team All-Nebraska Designated Hitter Mark Waldron, a recent graduate of Creighton Prep. Waldron, a student of Wetzel's for the past seven years, has recently committed to play college ball at Butler County Community College in Kansas, one of the top baseball JUCO's in America. First of all, Mark is not completely blind. Although an incurable eye disease known as macular degeneration has robbed Mark of most of his central vision, he retains sufficient peripheral vision to perceive what hitters are doing with their heads, hands, hips and feet -- the building blocks of the Wetzel swing. He teams up with his son Lance and other long-term assistants to analyze swings and prescribe drills intended to improve bat speed, contact and power. Secondly, and more importantly, Mark's success is the result of an all-consuming desire to comprehend and master the science and art of hitting -- a journey that has to taken him to major league front offices and clubhouses, where he has developed professional associations with, and earned the respect of, some of the top names in baseball, including newly-elected Hall of Fame member Tony Gwynn, and long-time hitting instructor, Merv Rettenmund. As a result of this quest, Mark's knowledge of the fundamentals of successful hitting at every level is extraordinary. Explore this website to learn more about this remarkable man and the remarkable success that he has had instructing young hitters. If you or someone in your family has the desire and commitment to become a top hitter, a visit to the Blind Guy is one of the best things you can do to help to realize that dream.